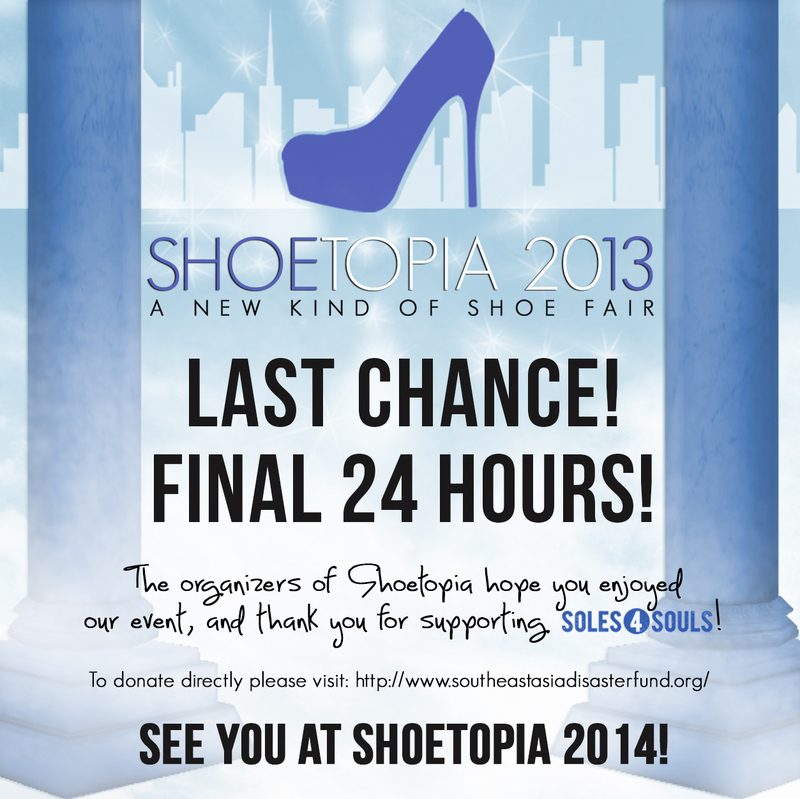 Press Release: SHOETOPIA 2013, Delay of Charity Receipt. 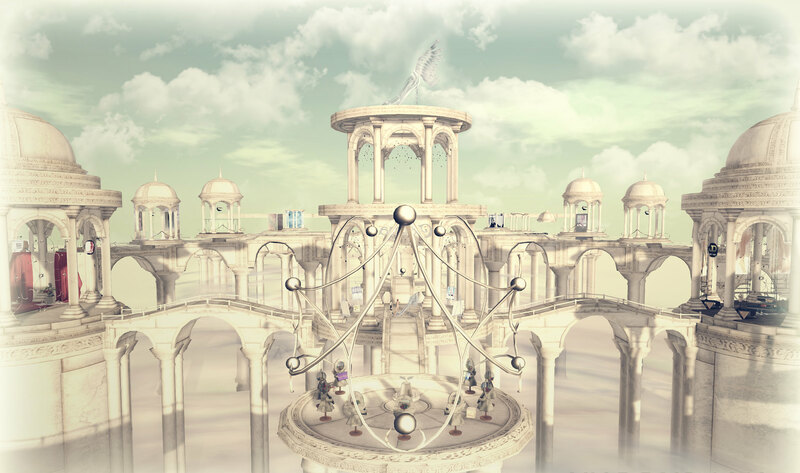 SHOETOPIA 2013, the Second Life Shoe Fair held this past November 15th – 30th, 2013, was a great success. The SHOETOPIA organizers, Anessa Stine and Sophia Harlow, are committed to maintaining transparency and preserving the goodwill and trust of their valued patrons, supporters, fellow designers and associates. A grand total of 1,514,611 Linden Dollars have been raised by the SHOETOPIA 2013 event for the Soles4Souls charity organization and paid directly to their Second Life account (Soles4Souls Resident). However, due to staffing changes at Soles4Souls and inexplicable delays at Linden Labs, there has been a delay in the Soles4Souls charity organization gaining access to their funds. According to representatives of Soles4Souls, several phone calls and multiple Support Tickets have been submitted to Linden Labs without response. All interested parties have yet to see a formal receipt for the donated funds, as Linden Lab demonstrates no urgency to help Soles4Souls receive their donations within a reasonable time frame. Looking ahead, preliminary planning has already begun for SHOETOPIA 2014, designer application will open in May of this year, blogger applications will occur at a later undisclosed date. It is shaping up to be an even bigger and more exciting event than last year’s very successful debut. Information will be posted at http://slshoetopia.blogspot.ca/ as it becomes available. Should anyone wish to verify the content of this Press Release, please contact Soles4Souls directly at the contact information indicated below. Any general questions regarding SHOETOPIA can be directed to Sophia Harlow or Anessa Stine by means of Second Life Notecard or Instant Message. After 11 months of planning, plotting, a bit of crying, MAYBE a little screaming, and moments of severe anxiety; Anessa and I are just in awe that we are mere hours from the closing of the first Shoetopia. A huge, and I mean HUGE, thank you to every single designer, consumer, blogger and anyone at all who helped make this event happen. The product designers put out, blew us away. The images and blogs the bloggers posted - just amazed by your dedication. The gacha designers - wow. You all humbled us more than words can express, and from the bottom of our 'soles' we appreciate your time and talents! GOS, LaRoo, SLink and Just Design - thank you for being our main sponsors. What an amazing group. Thank you, thank you. All our secondary sponsors and shoe designers - this event would never have happened without you! Rebeca Bashly - thank you for a build that just exceeded all our expectations. Paco Pooley - thank you for the gorgeous Gacha angels - they were exactly what Anessa envisioned. Truth Hawks - thank you for the use of your two sims. You're kind gesture will make it possible for us to donate more to Soles4Souls, thank you. Eden Knoller and Katya Valeska - what would we have done without you two? Thank you for being so incredibly important to our Shoetopia family. I will be contacting the Soles4Souls contact early next week for final totals. Once I have them and an official receipt - I will post here, Flickr, Plurk and I am sure Anessa and I will post them on our own blogs to make sure all numbers hit the feeds. So what do you say? Same time? Next year? Start looking for applications and invites for Shoetopia 2014 in May of next year. We will be closing those pearly shoe gates at 11:59pm slt Nov. 30th! Stay tuned for final tally and receipts from Soles4Souls as soon as we receive them! Come shop with us one more time! 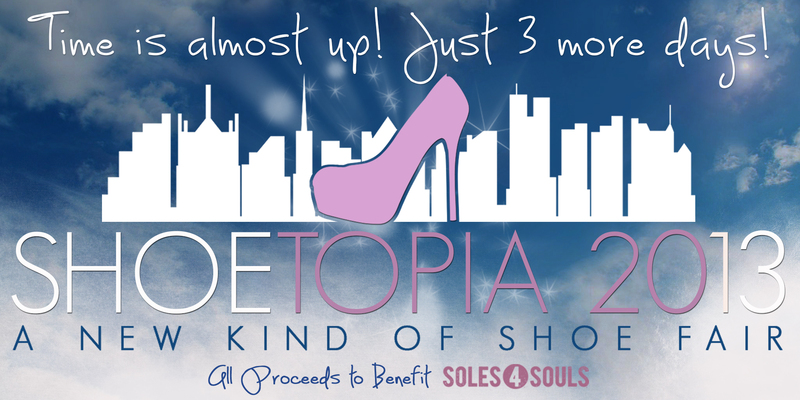 Shoetopia 2013 will end on November 30th, that means you have just a few more days to visit Shoe Heaven, shop for great footwear, and support Soles4Souls! Traffic has leveled off and all the little bugs have been worked out, so we hope you will visit again and enjoy the booths, the gacha goodies and the build. When visiting Shoetopia we ask that you do your part to help keep the shopping experience as heavenly as possible for everyone, by removing unnecessary scripts, accessories, huds, and by wearing system clothing, you can be a lag fighting angel! Look for further information about the event to be posted on our official blog, and courtesy of our amazing Shoetopia Bloggers. Join our flickr group, and add your photos of your fabulous finds! We hope you have enjoyed Shoetopia 2013 and we welcome your feedback in notecard form, delivered to either Anessa Stine or Sophia Harlow. 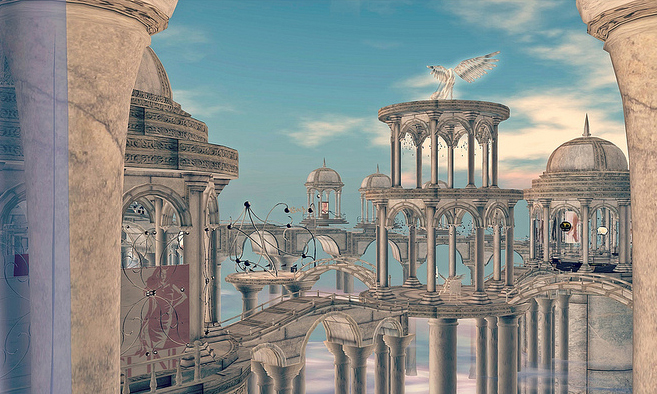 And just like that... the clouds have parted, today is the day when shoe heaven comes to Second Life! At noon today (slt), we will throw open the pearly gates and welcome one and all to visit Shoetopia, the much anticipated return of the Shoe Fair! We promise you an event like no other, an ethereal walk in the clouds combined with the most incredible shoe shopping you have yet to experience. 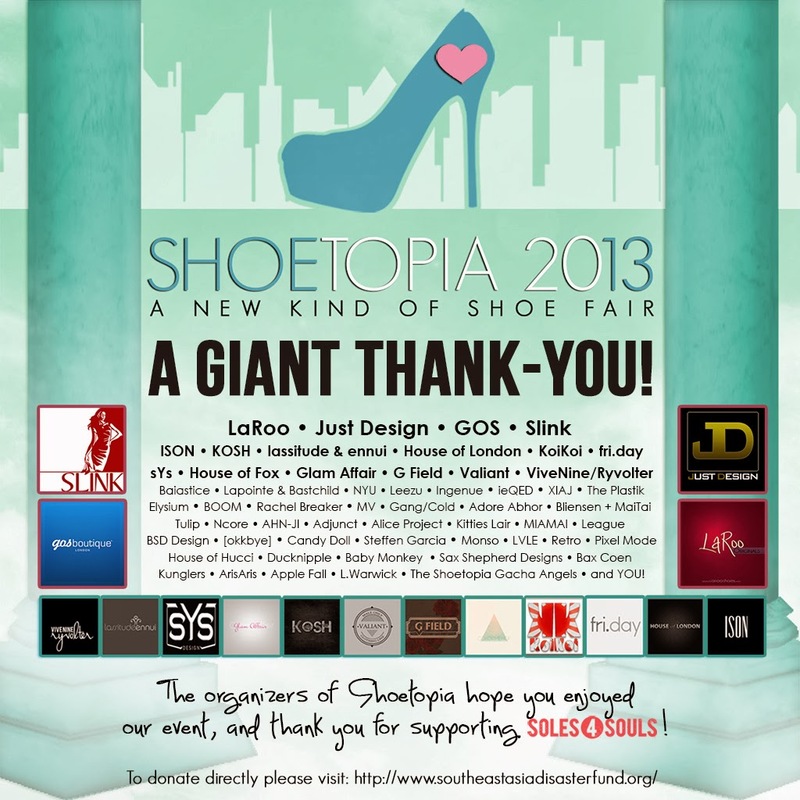 With dozens of the best footwear designers SL has to offer, 4 distinct gacha areas, an easy to navigate event venue, and the knowledge that you will be supporting a great cause, Shoetopia truly is a different kind of Shoe Fair! We wish you all a fabulous event, and we welcome your feedback in notecard form, delivered to either Anessa Stine or Sophia Harlow. 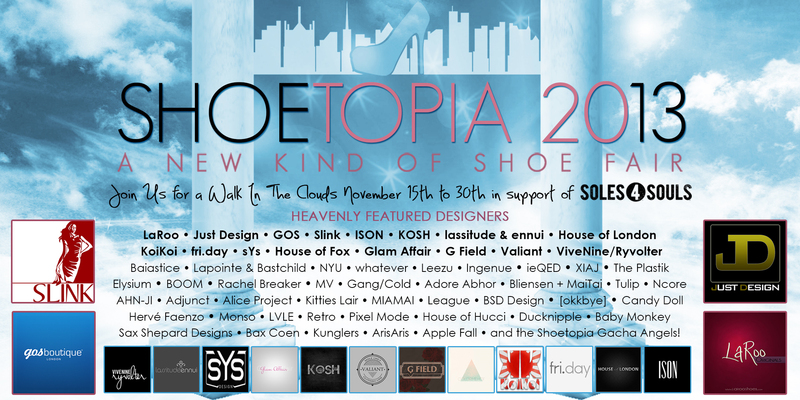 Featuring New Releases from more than 50 fantastic footwear designers and dozens of gacha vendors too! 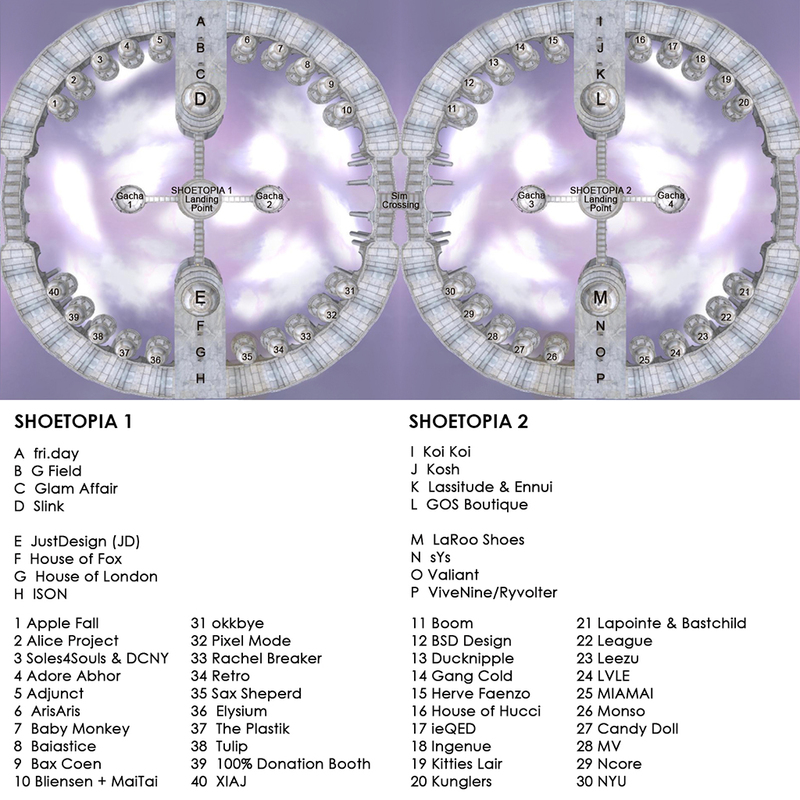 Shoetopia is set to open on November 15th at Noon SLT. Here is the map of the venue to keep you going until the 'pearly gates' open up for one and all! Calling all Angels... see you in Shoe Heaven soon!